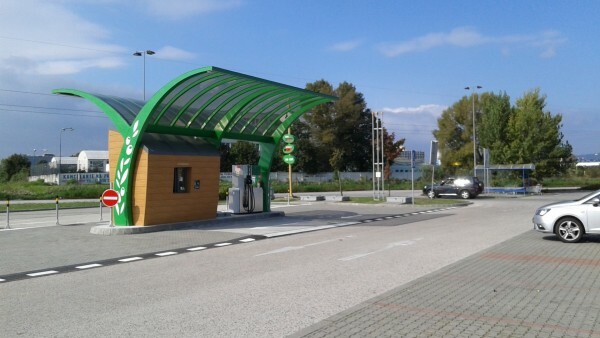 OLIVA petrol stations are small service stations without offering additional products, located on the small pieces of land in centres and densely built-up urban areas. They are notable for their unique and minimalist design, making the building a pleasant and genial construction that easily and naturally integrates into any environment, without significantly pressing the surrounding architecture. By reducing costs necessary for construction, as well as for the petrol station’s operation itself, Oliva is able to offer customers quality fuel at very good prices. A further benefit for the customer is the petrol station’s quick accessibility and quick service. Since we want visiting a petrol station to be as easy and efficient as possible, a service attendant is available at all OLIVA petrol stations, whose main job is to refill fuel tanks and accept payment for purchases.